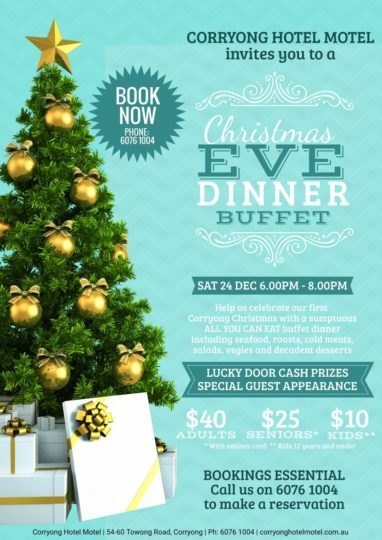 Join us from 6.00pm – 8.00pm on Christmas Eve for an “all you can eat” dining experience. There’ll be seafood, roasts, leg ham and all the trimmings, all topped off with Christmas Pudding. All cooked and prepared fresh in our kitchen! If you don’t have family of your own or are just looking to avoid the hassle of doing all the cooking, why not book a table and join us as we celebrate our 1st Corryong Christmas. Contact us on 02 6076 1004 to make a reservation.